These rules have been verified by our friend, Matteo Fontana, a native of Milan now living in Florence. 1. Only order cappuccino in the morning. Never after a meal. Ever. It’s too heavy. 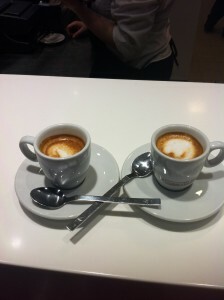 Most Italians drink espresso in the morning, but some have cappuccino or a latte (more milk and more coffee compared to a cappuccino and no foam). This is the most important rule. 2. You can drink an espresso anytime during the day or night. Total average time to order, drink and pay for an espresso for an Italian is 1.7 minutes. 3. Speaking of espresso, there is no “x”. Espresso …not expresso. 4. A true espresso is made with a machine that presses air and water with force (pressure) through the coffee grinds, otherwise it is technically a “cafe”. 5. However, you can order a “cafe” in a bar and you will get an espresso by default because they only serve coffee with espresso machines. 6. It is ok to drink a latte before bed to help you go to sleep. (The milk does it). 7. The only time you should drink a cappuccino after breakfast time is if you have to go to the bathroom, and in this case you must also smoke a cigarette. This is only for women; men are more regular. 8. During the day you can have a little milk in your espresso in the form of a macchiato, but you must specify if you want the milk cold (freddo), otherwise it will be hot. Macchiatos pictured above! 9. A cafe “Americano” is an espresso with water added. 10. A cafe “lungo” (long) is an espresso that uses more water *and* coffee than an espresso. 11. If you want something really strong to kick you in the pants, order a ristretto, which is more concentrated (less water) than an espresso with the same amount of coffee. 12. If that doesn’t work, order a doppio, which uses twice the amount of coffee with the same amount of water as an espresso. Expect to pay 2x. 13. Finally, for something after a meal, order a corretto, which is espresso with a dash of liquor, such as grappa. (I prefer Sambuca). 14. And for the kids, it’s OK to have a latte macchiato, which is hot milk with a little coffee. Get it right, my friends or you will be swimming with the fishes. Just kidding! If you are an Americani all is forgiven because you are not expected to know any better. But now you do.